Premium ingredient cookies and cookie dough for businesses of all sizes. 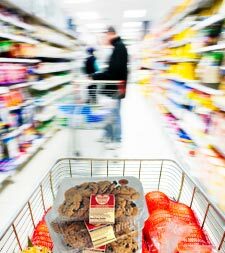 We make premium quality ingredient cookies and cookie dough for businesses of all sizes, from neighborhood gourmet markets to regional distributors, to national and international chains, and food service operations. We can also make products for any manufacturer or marketer of food or dessert items that wants to add these award winning cookies and cookie dough to their own brand lineups. Our unique ability to customize our product to your specifications is one of our company’s strengths. From our own selection of Jimmy’s branded proucts, to custom contract manufacturing, we are here to provide you and your customers with the very best cookie products.